Upholding the principles of compassion is central to any community’s ability to create a caring, respectful, and inclusive culture and climate. 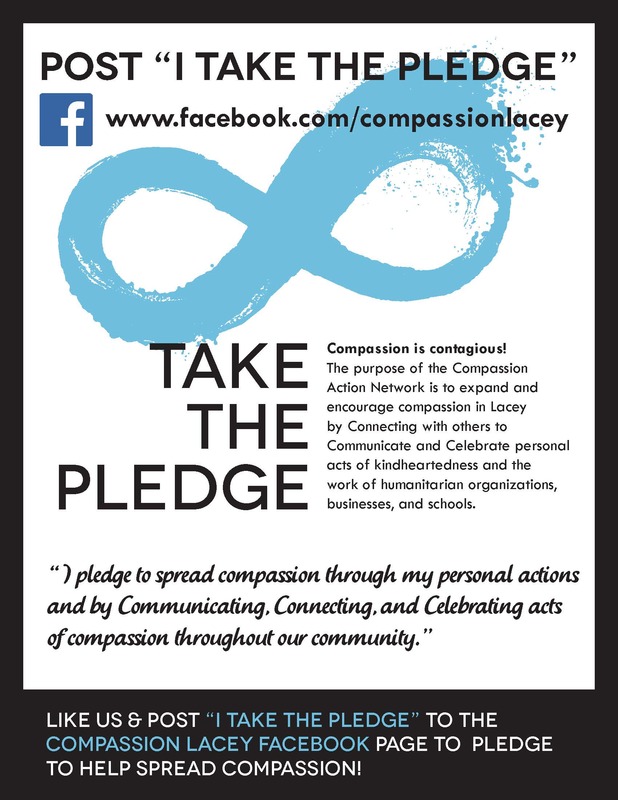 In recognition of this, the City of Lacey and North Thurston Public Schools signed on to the International Charter for Compassion and are working together to expand compassionate acts and programs in our community to assist citizens of all ages. A community forum was held in January 2016 to celebrate the diverse network of residents, schools, businesses, and organizations that provide the framework of compassion in our community. Through the Forum, we discussed how we can celebrate, nourish, and expand the invaluable work being done in the Lacey area. Compassionate Lacey is a campaign that began with the purest sentiment of compassion through a partnership with our local school district — a proud follower of the principles of the International Charter for Compassion — North Thurston Public Schools. We decided to come together as a greater community to explore how to expand compassion in our community and engage citizens of all ages. Before signing on to the Charter for Compassion, we wanted to really understand the idea of what it means to be a compassionate community — and to involve our citizens, neighbors, and friends in the discussion. We realized that we needed this involvement to help determine what the focus areas of our campaign should be, and use this to help inform our campaign goals and objectives. We wanted to bring members of our community together. We wanted to be able to create connections, to share information, and to explore ideas … all surrounding this concept of compassion. In order to have a meaningful conversation, we needed to explore what it means to be compassionate and to take a look at what we’re already doing here in our community. A community forum was held in early 2016 to celebrate the diverse network of residents, schools, businesses, and organizations that provide the framework of compassion in our community. Through the forum, we discussed how we can celebrate, nourish, and expand the invaluable work being done in the Lacey area. Through much discussion, participants echoed much of the same sentiments as others, and with that, we were able to break down and organize the emerging themes. Celebrate: Compassion does exist in our community, and our community recognizes this. We feel that it is vital to celebrate and recognize current and future compassionate acts to help keep this campaign at the forefront of our minds, and actions. Connect: We need to be able to support conversations in a way that connects our community together, to continue building the campaign. Create: We need to keep this movement alive and create an environment that will foster future progress of the campaign. Ongoing Communication: Continued outreach is vital to keep the movement in motion, which includes both outreach to our citizens, and from citizen to citizen. As of the launch of the campaign, we maintain a list of interested individuals (our Compassionate Contacts) that we regularly communicate with. Community Connection: We realize there needs to be a way to connect people together to take action. With this thought, the Compassion Lacey Facebook page (www.facebook.com/compassionlacey) acts as a virtual portal for outreach, and is open to the public for ongoing discussions. We hope to build this network in the future, and utilize for other aspects of the campaign. Lacey Compassion Action Network (C.A.N. ): To help foster community involvement and citizen-to-citizen discussions, interactions, and actions, we will propose a Lacey Compassion Action Network. This network will be comprised of community members that feel passionately about our community and will be self-selected to participate. There, members of Lacey C.A.N. will be able to bring their unique perspectives to discuss community needs and ways to meet those needs. Lacey C.A.N. may also nominate individuals, service clubs, or other organizations to be recognized at scheduled city council and school board recognition events. Venue for Recognition: In order to recognize compassionate acts and services in our community, the Lacey City Council will be holding quarterly public recognitions at televised Council meetings.